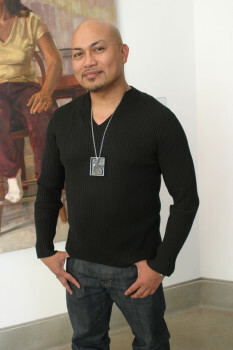 Photographer and Ceramics artist, Robert Ragazza, was born in the Philippines and raised in San Jose. He grew up embracing the diverse cultures, believing that they all have commonalities. As one of his passions, community volunteerism, he has donated countless hours of his time as well as his artworks for fundraising, supporting the arts and to give back to the communities that inspire him. He currently juggles multiples projects while still find times to work as a Volunteer Teaching Assistant for Terri Garland at San Jose City College Photography Department. Robert is a prolific photographer. He has shot covers, fashion and editorial portfolios for modeling agencies and product lay-out for magazines. Never without a camera, Robertino engages himself in knowing his subjects, making them aware he is genuinely interested in their stories. An observer who loves to capture the moment, his influences are countless and spontaneous. Observations through life experiences and travels affect Robert’s creativity, finding he is at his best with street portrait work. The visual expressions of emotion is apparent in each photo he takes, whether the focus is a young girl chasing a pigeon, a homeless man with multiple layers of blankets wrapped around his waist, or an older man who just been startled and awaken while in transit. “Light becomes my paintbrush and printing provides the meditative process that brings life to my subjects, giving me patience and a sense of peace,” says that Buddhist convert. Robert’s photographic style is composed of images that are captivating yet poignant, a culmination of sharp attention to details, precise lighting, and strong composition with great visual sense. In today’s world of digital images, Robert still works with films, finding the excitement of waiting and element of surprise fascinating. Robert’s photographic series are ongoing documentations of the beauty, struggles, grief and joys of life around. His eventual ambition is to create a narrative exhibition from the imagery he has taken around San Jose. Goals: Exhibit about 200 black & white traditional selenium-tones silver gelatin photographic images of San Jose in a gallery and concurrently project those same images as a slide show on the side of the City Hall and throughout the city’s buildings visible for the public to see….. When I received my Emerging Artist Fellowship, I finally felt that my hard work, dedication, and my vision to my craft had been recognized. The validation was very important and it was the greatest feeling ever. Stay true to your vision in your artistic discipline and work hard with dedication. The arts scene in San Jose has expanded exponentially. It is being, finally, recognized on the national level and beyond. Being a local artist, I am ecstatic to be part of this artistic community.